Today’s workplace is vastly different than it was 30 years ago. It used to be that a business could rely on a single team in a single location to get things done. These days, business is more diverse, dynamic and distributed than ever before. Decisions have to be made fast, teams need to align quickly and time can’t be wasted on repetitive, manual tasks. Consequently, companies that rely on decades-old, legacy work systems may find they aren’t agile enough to compete and stay relevant. G Suite makes this possible. It transforms the way teams collaborate, with intelligent tools that help them solve problems faster and focus their time on work that matters. Today, we’re announcing new, intelligent updates to G Suite to give businesses even more ways to manage projects—like closing a sales deal or bringing a new product to market—from one place. Use a new, centralized platform to stay aligned on projects and make decisions quicker. Available today, Hangouts Chat makes it easy to collaborate efficiently so teams can make faster decisions. With team chat rooms and threaded conversations, powerful search functionality and intelligent bots that connect workflows and speed up tasks (even with 3rd party apps), you can work on projects from one spot—like opening a new store location or launching an advertising campaign. Chat has deep integrations with other G Suite apps like Google Drive, Calendar and Hangouts Meet, and built-in security to meet retention, eDiscovery and regulatory/compliance needs for enterprises. Read more about Hangouts Chat or learn how you can build your own bots. Spend less time setting up meetings and more time accomplishing goals. We want to make it simple to manage meetings, which is why we’ve built tools to help you surface conference room information and find times to meet. In the coming months, Calendar will use artificial intelligence to automatically suggest rooms for you to book. And because they’ll be optimized for each attendee based on their building and floor location, previous booking history, audio/video equipment needs and room capacity requirements, you can feel confident that you’re booking the right space for your team to be productive. Solve problems face-to-face with teammates over video, right away. Sometimes it’s best to jump into an online meeting face-to-face with colleagues so you don’t hold up progress. Now, your team can quickly transition from a conversation in Chat and join a Hangouts Meet video conferencing meeting with just a few clicks. Spend less time searching for the right documents and more time crafting ideas. Today, we’re bringing Quick Access to Docs to help teams focus their time on work that matters (similar to Quick Access in Drive). Quick Access uses artificial intelligence to suggest relevant files based on signals like Drive activity and information in your documents, so you can work with the most up-to-date information and create new material quickly. Let’s say your global marketing team needs a central project plan; the team can start a Doc and use Quick Access in the Explore panel to find information from related files and add it into the plan quickly. To stay relevant, businesses must transform how they operate. 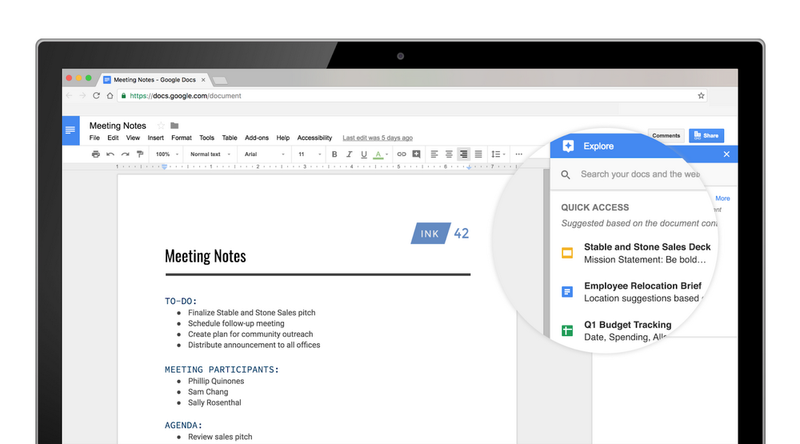 Try today’s updates in G Suite and empower your teams to work better together. This entry was posted in Official Google Blog and tagged calendar, docs, G Suite, google cloud, Hangouts on February 28, 2018 by David Thacker. Teams want to be able to get their work done in one place, which is why we introduced the Early Adopter Program of Hangouts Chat to bring teams together. Today, we’re making Chat generally available as a core G Suite service. The @Google Drive bot which lets you know when files are shared with you, comments are made or when people request access to your docs. The @Meet bot which integrates directly with Calendar to schedule meetings for you. In case you’re wondering, Chat is compatible with Hangouts and works with your existing contacts. To get started, go to chat.google.com on the web or download the app on your desktop or mobile devices. Chat will be made available over the next 7 days. Here are some handy resources on Hangouts Chat and Meet to help you get started (or just use this cheat sheet). This entry was posted in Official Google Blog and tagged G Suite, Hangouts on February 28, 2018 by Scott Johnston. 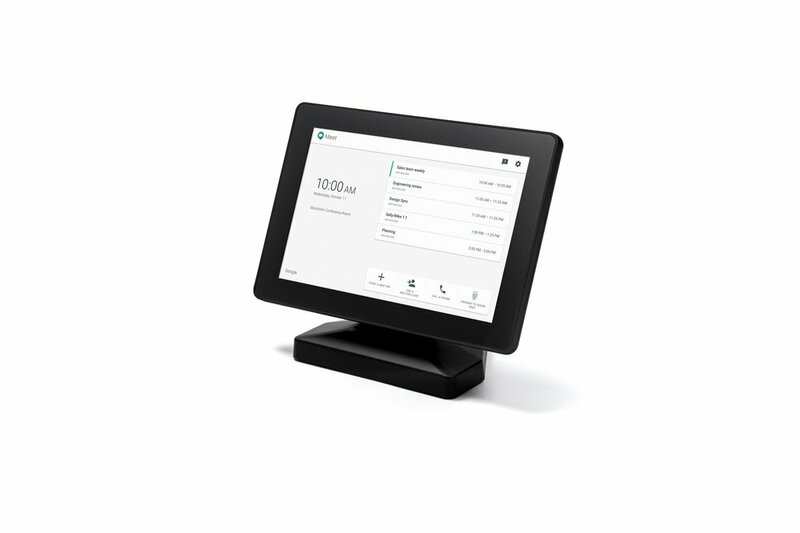 To learn more about Hangouts Meet hardware, check out our website. This entry was posted in Official Google Blog and tagged G Suite, Hangouts on February 6, 2018 by TJ Varghese. With G Suite, we’re focused on building tools that help you bring great ideas to life. We know meetings are the main entry point for teams to share and shape ideas into action. That’s why we recently introduced Hangouts Meet, an evolution of Google Hangouts designed specifically for the workplace, and Jamboard, a way to bring creative brainstorming directly into meetings. 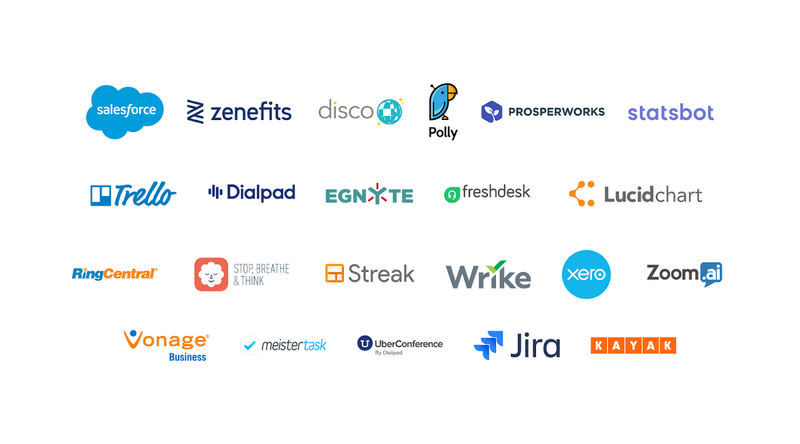 Combined with Calendar and Drive, these tools extend collaboration beyond four walls and transform how we work—so every team member has a voice, no matter location. 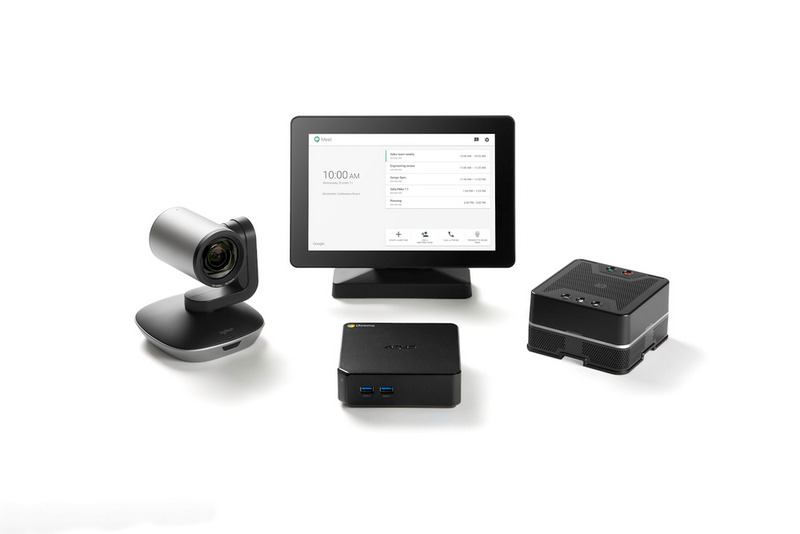 Hangouts Meet hardware is a cost-effective way to bring high-quality video meetings to your business. The hardware kit consists of four components: a touchscreen controller, speakermic, 4K sensor camera and ASUS Chromebox. The 4K sensor camera with 120° field of view easily captures everyone at the table, even in small spaces that some cameras find challenging. Each camera component is fine-tuned to make meetings more personal and distraction-free. Built with machine learning, the camera can intelligently detect participants and automatically crop and zoom to frame them. 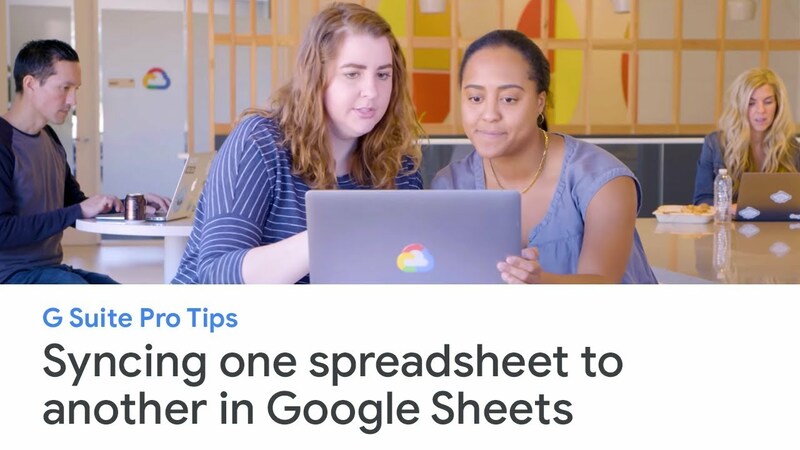 This entry was posted in Google Drive Blog and tagged Connected Workspaces, Drive, G Suite, google cloud, Google Drive, Hangouts on October 31, 2017 by Katie Roberts-Hoffman. 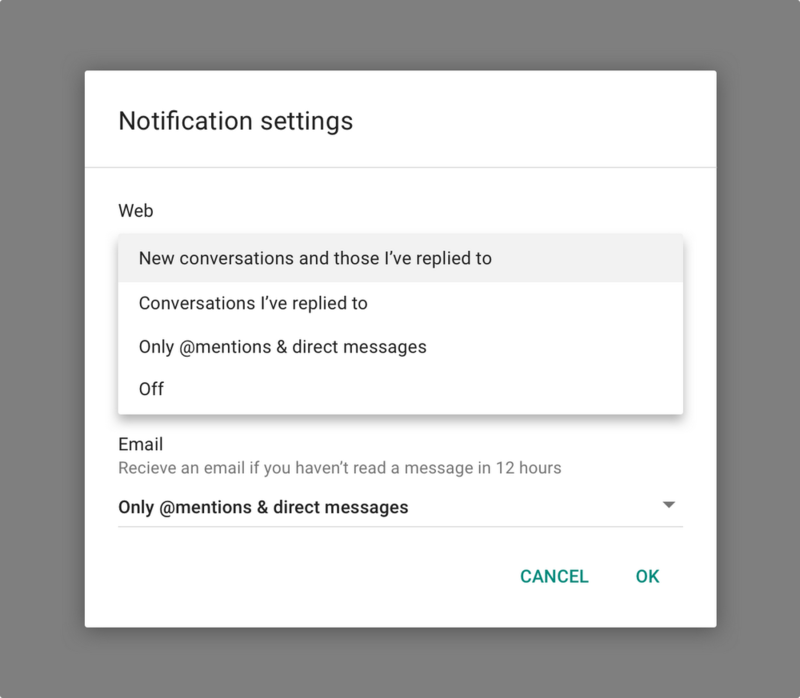 This entry was posted in Google for Work Blog and tagged Connected Workspaces, Drive, G Suite, google cloud, Hangouts on October 31, 2017 by Katie Roberts-Hoffman. This entry was posted in Official Google Blog and tagged Connected Workspaces, Drive, G Suite, google cloud, Hangouts on October 31, 2017 by Katie Roberts-Hoffman. Editor’s note: this is the first article in a five-part series on Google Hangouts. I’ve worked at Google for more than a decade and have seen the company expand across geographies—including to Stockholm where I have worked from day one. My coworkers and I build video conferencing technology to help global teams work better together. It’s sometimes easy to forget what life was like before face-to-face video conferencing (VC) at work, but we struggled with many of the same issues that other companies deal with—cobbled together communication technologies, dropped calls, expensive solutions. 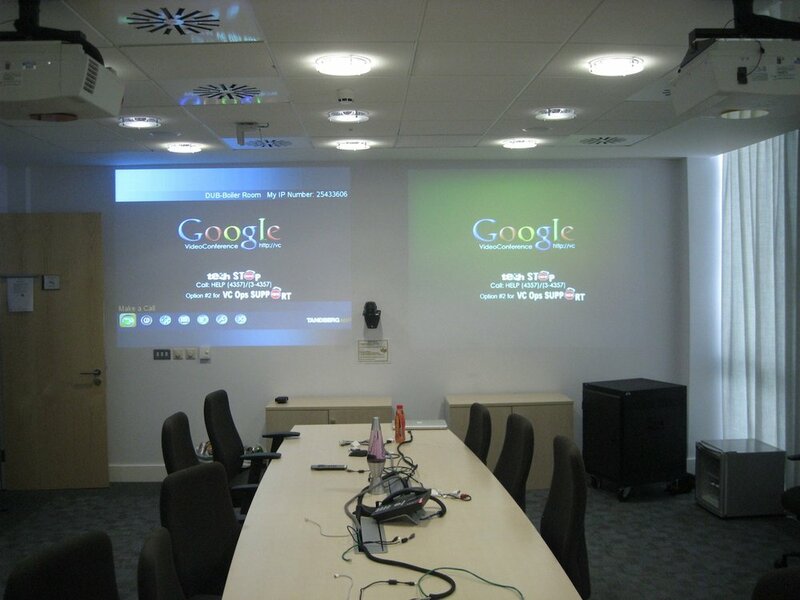 Here’s a look at how we transitioned Google to be a cloud video meeting-first company. In the mid-2000s, Google underwent explosive growth. We grew from nearly 3,000 employees to more than 17,000 across 40 offices globally. Historically, we relied on traditional conference phone bridging and email to communicate across time zones, but phone calls don’t exactly inspire creativity and tone gets lost in translation with email threads. We realized that the technology we used didn’t mirror how our teams actually like to work together. If I want to sort out a problem or present an idea, I’d rather be face-to-face with my team, not waiting idly on a conference bridge line. 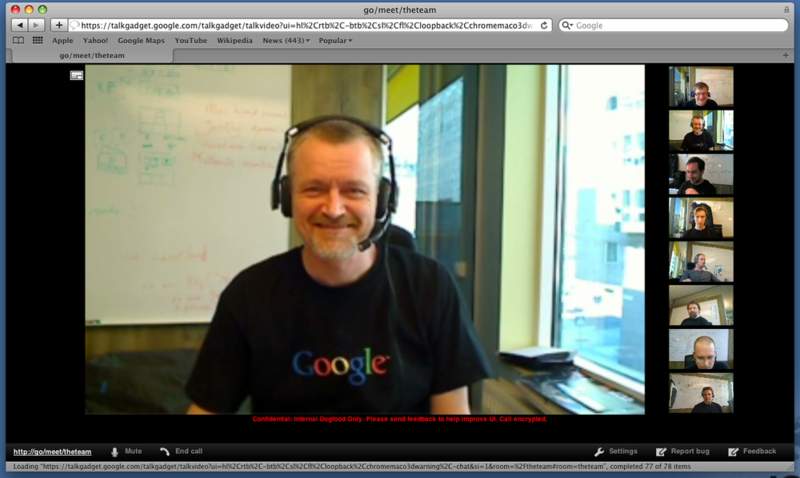 Google decided to go all in on video meetings. We outsourced proprietary video conferencing (VC) technology and outfitted large meeting rooms with these devices. If I need to sort out a problem or present an idea, I’d rather be face-to-face with my team, not waiting idly on a conference bridge line. While revolutionary, this VC technology was extremely costly. Each unit could cost upwards of $50,000, and that did not include support, licensing and network maintenance fees. To complicate matters, the units were powered by complex, on-prem infrastructure and required several support technicians. By 2007, nearly 2,400 rooms were equipped with the technology. The system was built to host meetings for team members in the office, but didn't cater to people on the go. As more and more Googlers used video meetings, we reached maximum capacity on the technology’s infrastructure and experienced frequent dropped calls and poor audio/visual (AV) quality. I even remember one of the VC bridges catching on fire! We had to make a change. In 2008, we built our own VC solution that could keep up with the rate at which we were growing. We scaled with software and moved meetings to the cloud. Our earliest “Hangouts” prototype was Gmail Video Chat, a way to connect with contacts directly in Gmail. Hours after releasing the service to the public, it had hundreds of thousand of users. While a good start, we knew we couldn’t scale group video conferencing within Gmail. We built our second iteration, which tied meeting rooms to unique URLs. We introduced it to Googlers in 2009 and the product took off. During this journey, we also built our own infrastructure (WebRTC) so we no longer had to rely on third-party audio and video components. Our internal IT team created our own VC hardware prototypes; we used touchscreen computers and custom software with the first version of Hangouts and called it “Google Video Conferencing” (“GVC” for short). With each of these elements, we had now built our earliest version of Hangouts. After a few years of testing—and widespread adoption by Googlers—we made the platform available externally to customers in 2014 (“Chromebox for Meetings”). In the first two weeks, we sold more than 2,000 units. By the end of the year, every Google conference room and company device had access to VC. Nearly a decade has passed since we built the first prototype. Face-to-face collaboration is ingrained in Google’s DNA now—more than 16,500 meetings rooms are VC-equipped at Google and our employees join Hangouts 240,000 times per day! That's equivalent to spending more than 10 years per day collaborating in video meetings. And, now, more than 3 million businesses are using Hangouts to transform how they work too. Encourage video engagement from the start. Every good idea needs a champion. Be seen as an innovator by evangelizing video engagement in company meetings from the start. Your team will thank you for it. If you’re going to move to VC, make it available everywhere. We transformed our work culture to be video meeting-first because we made VC ubiquitous. 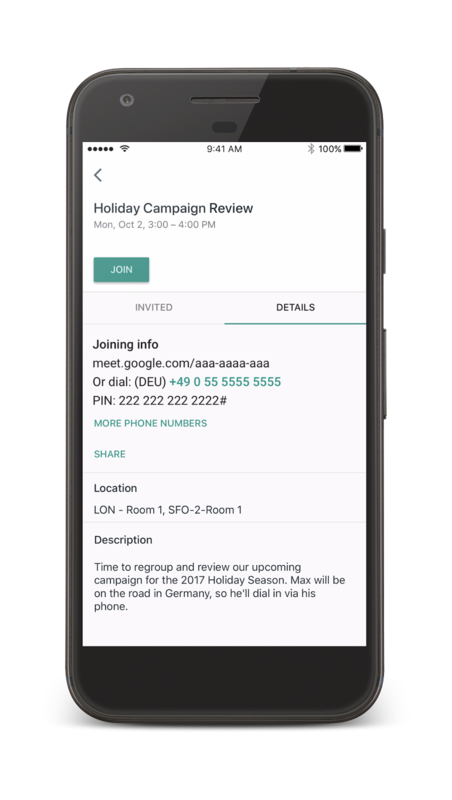 Hangouts Meet brings you a consistent experience across web, mobile and conference rooms. If you’re going to make the switch, go all in and make it accessible to everyone. Focus on the benefits. Video meetings can help distributed teams feel more engaged and help employees collaborate whenever, and wherever, inspiration strikes. This means you’ll have more diverse perspectives which makes for better quality output. What’s next? Impactful additions and improvements to Hangouts Meet will be announced soon. All the while, we’re continuing to research how teams work together and how we can evolve VC technology to reflect that collaboration. For example, we’re experimenting with making scheduling easier for teams thanks to the @meet AI bot in the early adopter version of Hangouts Chat. This entry was posted in Official Google Blog and tagged G Suite, google cloud, Hangouts on September 21, 2017 by Serge Lachapelle.